Sleep is amazing! I’m so ready to come back and tackle the final leg of the school year. Congratulations to our amazing guard for being the best representation for La Cañada High School competing in the World Championships in Dayton, Ohio. They were amazing in every way imaginable! Check them out this Saturday for our So Cal Championship weekend. Looking forward to the end of year events and music making. See you all soon! Congratulations to our amazing Drumline for a truly successful season. Their show was wonderfully entertaining and I’m proud of all the hard work put in by the members and staff. It’s so good to see LC Drumline on the rise again! Come join me and my kids as we watch the Winter Guard’s Prelim performance on Wednesday at 2:45pm in the band room. Looking forward to cheering them on from across the country! Congratulations to all our active groups this past week! A huge trophy was brought home by our Orchestra from a festival in San Diego for what we all knew already, that we have the best orchestra around. Color Guard performed beautifully in their last competition before heading to Dayton and World Championships. Our Marching Band helped dedicate the new City Hall this past week with great music to add to this meaningful community event. 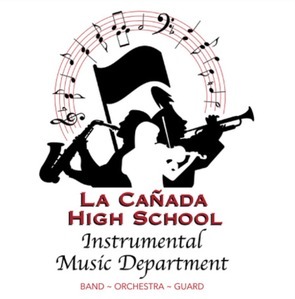 In all these events, the students, staff, and parents of our Instrumental Music Program stepped up and represented La Cañada fantastically to all who attended. It makes me proud that we have such an amazing program of amazing people. Thank you all for your help and support at each of these events. Congratulations to all our performing groups doing an amazing job at Festival this past Friday. You represented our music program and school so well. Also, a big thank you to all the parent volunteers who gave of their time to make the festival a tremendous success. We received so many positive comments about our festival and how enjoyable the experience was. A final, gigantic thank you to all the students who made the festival run so smoothly. You all were such a shining example of professionalism and class throughout the entire day. Thank you for your awesomeness! March! I can’t believe it’s here. Festival concerts and Festival around the corner with our Orchestras and Bands working hard to be the amazing groups that they are. Winter indoor seasons are in full swing with our amazing guard and drumline have stellar beginnings while continuing to work hard towards an amazing finish. Come support all these great groups by seeing them live… you will not be disappointed. Thank you all for your help and support and I look forward to seeing you all at our upcoming events. As I was driving to go pick up my kids from school one day this past week, I saw a crossing guard, for lack of a better word, practicing his job. He was crossing absolutely no one. There was no one around, just him and the sign in the middle of the crosswalk. It made me laugh out loud and later think that this professional crossing guard is working at bettering his craft. As musicians, as people, we should always be practicing and improving ourselves to be better and stronger at our chosen craft. As we spend the next weeks preparing for festival, we will all need to practice a bit alone, so that when we rehearse together, we will be at our best. Thank you all for your support for the Dinner Show! It was such a great evening of music and community! Winter Guard and Drum Line are off to an amazing start. Their hard work is being showcased at many local shows this month and next. Take time to go and support these amazing groups. Meanwhile, Orchestra is heading to San Diego to represent our program in a national festival. I am sure they’re going to be the toast of the festival. Good luck, Orchestra. I love seeing all these groups progress and showcase themselves all over the state and country. It’s a tribute to their hard work that they are able to be recognized and compete at such high levels. I’m looking forward to seeing all these groups progress! I love the idea that music is a common thread and binding element in all cultures. It brings people together, allows sharing of deep emotional moments or shallow fun that breaks through language barriers. It brings communities together and connects the members through a shared experience. There is no other force that can do so much for all of us. It doesn’t even matter if you are performing or if you are listening, everyone is a participant and everyone has an important role in making a musical moment. It truly is the best thing in the world! Hope you come and join in!